A mention of Pike’s Pizza in Friday’s Washington Post Weekend section brought to mind a food I recently discovered -- the salteña. Over last season’s farmers market in the Del Ray neighborhood of Alexandria, Marcela’s Bakery, which is located just up the road on Mt. Vernon Ave., set up a table where beef and chicken salteñas were sold. 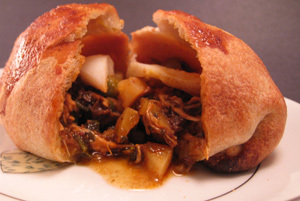 After my first one, (actually two because I had to test out the beef after having the chicken salteña) I grew fond of the dough filled parcels. It became my breakfast each Saturday I visited the market. Fresh out of the oven, the hot chicken and beef salteñas were beautiful with their egg-washed golden crust topped with a braid which secured the soupy mix inside. The Bolivian salteña is a staple food in its native country and is served often for breakfast and as a mid-day snack at roadside stands. This labor-intensive savory pastry takes days to make from the sweet pastry to the gelatin thickened broth inside. Once the outer pastry and filling are made, the dough is wrapped around the filling and secured with a telltale braid on top. I liken the salteña to a hand held pot pie. Sweet crust encapsulates a juicy filling of chicken or beef (sometimes both) with hard boiled egg, diced potatoes, peas, olives and raisins. Brought to Northern Virginia by Bolivian immigrants to what is known as the Salteña Circuit (which centers around Columbia Pike stretching from Falls Church to Arlington), the salteña and Bolivian fare in general have, in the D.C. area, flown under the radar, so to speak. Although Arlington (called Arlibamba by some due to fact that most Bolivians immigrated to Virginia from Cochabamba) is home to the largest population of Bolivian immigrants in North America, many local residents are not familiar with Bolivian cuisine and the many restaurants that are nearby serving primarily Bolivian customers. More widely known among foodies and Northern Virginia residents is our plethora of Vietnamese and Korean food. In Washington, Ethiopian restaurants have been enormously popular. But Bolivian cuisine has quietly crept into our food scene, often disguised as a pizza joint or Tex-Mex restaurant. Tutto Bene in Arlington mainly serves Italian cuisine- but there is a separate Bolivian menu available and during the weekend, the restaurant teems with Bolivian-Americans enjoying the cuisine of their homeland. Tutto Bene serves thousands of salteñas per week. Pike Pizza, as recommended by Tom Sietsema in Tom’s Picks in fact doesn’t serve pizza anymore. It does however crank salteñas out of it’s pizza oven tray after tray. Approaching the salteña, one must have a strategy. 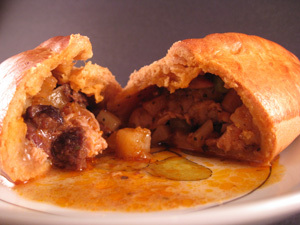 Unlike an empanada, the filling is quite juicy and eating it in hand takes skill. My approach is to eat the salteña on a plate or in its container with a knife and fork. First I cut into the top, then I scoop the filling out and tear away the crust a little at a time, sopping up the juices as I go. The true way to eat a salteña is to hold it in on hand, bite off an end and tip the juices into the mouth. Then eat the rest- no plate needed. No doubt, I would wind up wearing it if I tried that. On my salteña quest, I ventured past my tried and true Marcela’s Bakery and headed to Arlington where I purchased chicken and beef salteñas from Tutto Bene on N. Randolph St., a warm and friendly place which was starting to fill with Latino customers exchanging Spanish greetings with the owner. Next, I went to Pike Grill (not Pike Pizza) on Wilson Blvd. This restaurant was a more bare bones casual- Mom and Pop where mixed beef and chicken salteñas were cooking in the oven as I arrived. Through a window, I could see a woman cooking in the kitchen toiling over dough and cutting potatoes. Having to wait a bit for my salteñas, I was offered chicha morada, a drink they make themselves. Chicha morada is a bright red sweet drink make from boiling red corn and adding cinnamon, lemon and sugar...and lots of sugar. I departed from Pike Grill having left a nice tip in appreciation of the welcoming hospitality and refreshment and drove to My Bakery and Café in Alexandria (there are two other branches: one in Falls Church and one in Manassas). Here I picked up a mixed beef and chicken salteña and headed home for a tasting. 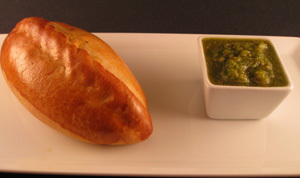 All salteñas were accompanied by a fiery salsa verde called llajua. This condiment can range from mildly spicy to hotter than Hades. It's best to dip a prong in first to gage the heat level. I got a bit overly confident with the llajua from My Bakery and Café and put about half a forkful into my mouth which resulted in the invocation of the Almighty’s name quite a few times in between grasping for milk or anything with fat, but mercifully, it didn’t last long. Decidedly, Pike Grill's llajua was the favorite between my husband Frank and I. It had a nice thick consistency and medium heat which did not blow out my taste buds. All of the salteñas I bought ranged in price from $2 to $2.50. My favorite was from Pike Grill because I thought the sauce had a fuller, spicy taste with a little heat in the sauce. Egg was definitely present in both salteñas and I got a nice hunk of green olive. Frank liked Tutto Bene’s salteña the best. I have to say the raisins in their salteña are a nice counterpoint to the heat of the filling. Not that there were any losers here as they were all excellent and beautifully made. If you haven’t treated yourself to a salteña or Bolivian food in general, I hope this inspires you to expand your foodie repertoire and try this delightful cuisine made by people who welcome you into their restaurant as if it were their home.